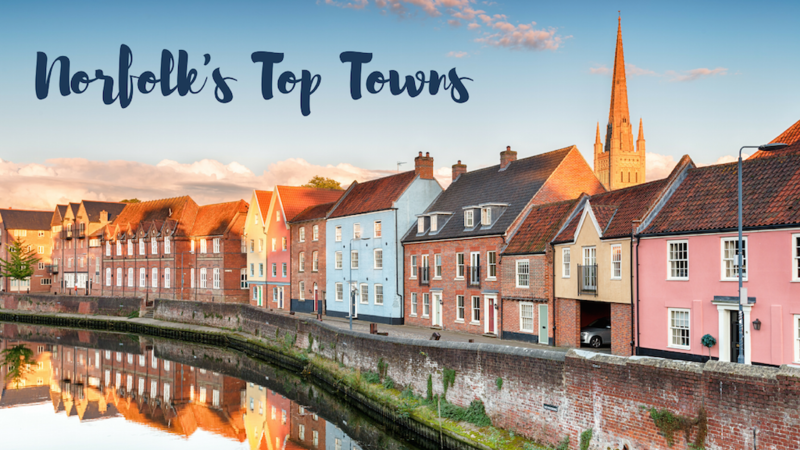 Norfolk once topped the list of Britain’s 20 Classiest Counties as put together by the Telegraph, so we’ve put together a list of the best towns to stay in Norfolk as it’s definitely worth a visit. It is a prestigious county in the east of England, boasting possession of its own beautiful coastline and sandy beaches so is the perfect holiday destination. Don’t forget to walk along The Norfolk Coast Path, it runs from Hunstanton in west Norfolk round to Sea Palling on the North Norfolk coast. If the above image of the Norfolk Broads isn’t convincing enough – the countryside of Norfolk is quite something to behold, and is privy to some of the country’s very best sunsets, meaning a warm glow is never too far away. 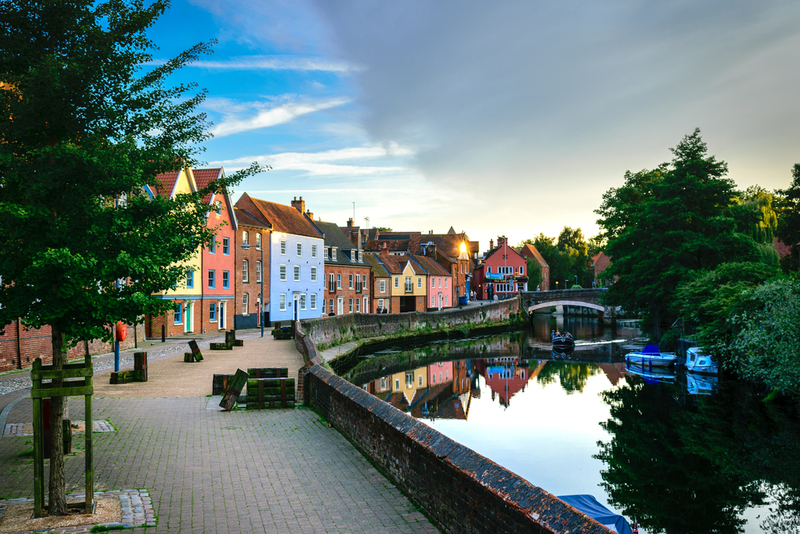 Norfolk is in fact the pinnacle of an English rural getaway, but has enough big towns to keep your modern-self happy. With zoos and sea life centres, Norfolk is at the ready to keep you entertained. Hunstanton is one of the best places to visit any time of year. Affectionately nicknamed ‘Sunny Honey’, Hunstanton is the unofficial sunset capital of the UK. From the famous, photogenic Hunstanton cliffs to the sweeping beach; there are a great range of outdoor pursuits to explore both on water and land. For the adventurous souls swing by Alive Oasis for swimming and a roller-skating rink or the Hunstanton Sea Life Sanctuary to get your fix of otters and penguins. Mostly, make sure you grab a cold beer from the White Horse pub and sit outside until the sun goes down. On the River Wensum we have Norwich. Far from other English cities, Norwich rocks its own vibe, mixing past and present in East-England fashion. As a regional capital, there is always a lively calendar of events and an impressive list of festivals, including the Norfolk Food & Drink Festival, and the King’s Lynn Festival. Just two hours’ train journey from London it’s a great rural-city break from the cut-throat metropolis of the capital. If you’re looking for the highlight of Norwich cuisine, pop into Grosvenor Fish Bar for the usual fish and chip fare, but also an interesting selection of sandwiches and posh nosh. There’s also a big ol’ art scene with the Sainsbury Centre for Visual Arts, home to works by Picasso and Degas. Known to locals as simply Yarmouth, here you can enjoy over 15 miles of beaches and numerous fantastic attractions. It’s a superbly convenient base from which to explore the Norfolk Broads. It’s got about as much sea-side charm as any one place can handle – we’re talking summer shows, adventure golf, arcades, freshly-baked donuts, fairground rides, fish and chips, ice cream and even a rollercoaster or two. From the beach, make sure you take a boat trip to Scroby Sands, where you might be able to get up close and personal with the seals who bask there on the sandbank. For a traditional family holiday everyone can get on board with, Yarmouth might be your perfect place. Wells-next-the-Sea is a beautiful seaside Norfolk town well worth a trip. Considered one of north Norfolk’s most attractive coastal dwellings, here you’ll find pine tree forests and wide beaches, perfect for fresh-crab-fishing and woodland exploring. Of course, it’s an Area of Outstanding Natural Beauty, so make sure you pack your cameras. Don’t miss their infamous annual Wells Carnival Week – a summer highlight for the town. And for the pinnacle of cute, have a look at the colourful stilted beach huts. So, there it is. When the UK sun emerges, most people think of Cornwall and Brighton—but, with its authentic coastal charm, natural beauty and wealth of local produce serving cosy English pubs, the best things to do in Norfolk should be talked about more often.